Larry Sdao’s late November confirmation that he would not renew The Brunswick House’s lease has galvanized the community into a discussion about the future of the notorious landmark. It’s also become a catalyst for a broader discussion about the future of the neighbourhood, and revealed disconnects between residents, business-owners, and the city itself. It’s but the latest step in Sdao’s long struggle to rehabilitate the student dive bar — a party venue known for cheap alcohol, late night noise, and police visits resulting from drunken crime — into something more community oriented. He purchased the building at 481 Bloor St. W. in 2003, and initially ran the venue himself. He tried to raise standards, adding security and increasing liquor prices, but wasn’t successful, so in 2005, Sdao leased the first floor to Abbis Mahmoud. Reports dating to that period indicate that Mahmoud met with community residents to explain his plan to renovate the space and create a family restaurant. But his business model contemplated a patio, something neither the neighbourhood nor the City of Toronto would countenance. Since then, Mahmoud, who appears to be based in Ottawa, where he runs his Urban Male Magazine, has operated the bar through his Dreammind Entertainment Group. 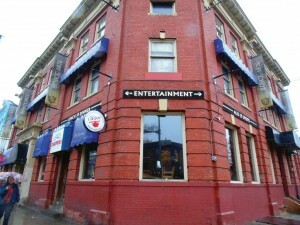 Only open Thursday to Saturday from 10 p.m. to 2.30 a.m., The Brunswick House continues to cater to a young, rowdy crowd. Sdao, meanwhile, was hamstrung by an automatic renewal clause in his lease with Mahmoud. It’s a clause that would take a court order to break, something that Sdao finally received a couple of years ago. Though he’s been searching for a different tenant ever since, Sdao only recently confirmed publicly that he will not renew Mahmoud’s lease when it expires at the end of December, and The Brunswick House, as with the gambling business on the upper floors, will keep its tenancy on a month-to-month basis for now. 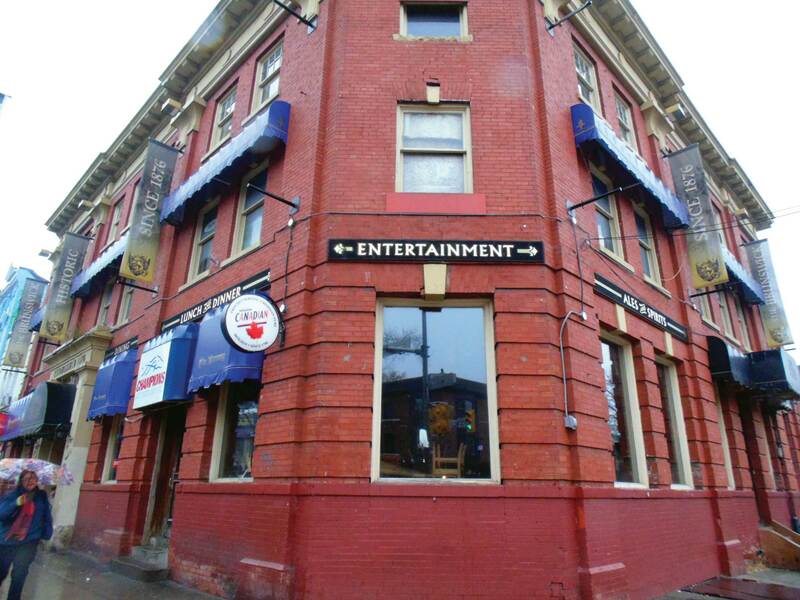 However, finding a new tenant for the 107-year-old building (although the bar dates its earliest incarnation as a saloon at a stagecoach stop in 1876, the Toronto Historical Board reports the building as being constructed in 1908) will be a challenge. Sources suggest that Rexall Pharma Plus was prepared to take over the first floor, but walked away after Heritage Preservation Services denied a preliminary application to make the heritage-listed building more accessible by creating a level entrance at the corner of Bloor Street and Brunswick Avenue. It was a proposed tenant that would have also suited the Bloor Annex Business Improvement Area (Bloor Annex BIA), which has been acting on an established plan to turn the right-of-way on Brunswick Avenue into a parkette stretching from the edge of the building to the sidewalk and Bloor Street south to the laneway. The Bloor Annex BIA, which together with the city is funding the parkette, has already selected a designer to create the potential green space. But when Rexall pulled out, Sdao was forced to go back to the drawing board. Enter Boston Pizza, and its proposal to replace the Brunswick with its sports bar-restaurant-patio combination that is the hallmark of the brand. It would the fourth franchise located in Toronto for the Canadian chain. Representatives pitched their plan at a packed community meeting hosted by the Harbord Village and Annex residents’ associations on Nov. 30. Boston Pizza’s team presented a conceptual drawing that would downsize the venue’s current capacity of approximately 600 to 369, spread over 140 seats in the dining room, 157 in the bar, and 72 on the patio. At this point, Boston Pizza has not made a formal application to the city, and is just exploring whether it could get buy in from the neighbourhood. Any application for a patio would have to go through City Hall, with the local councillor requiring that it be accompanied by a petition showing popular support from the residents who live in the immediate area. Residents have also expressed concerns about losing The Brunswick House’s rich heritage — it’s been a working class tavern, a noted jazz venue, and a gathering place for local literary lions — and wondered how the chain will integrate into Bloor Street’s stretch of independently-owned businesses. At the heart of these competing priorities and divergent agendas, then, is The Brunswick House, a building with a past as storied as the city itself, and just as deserving of a brighter future.